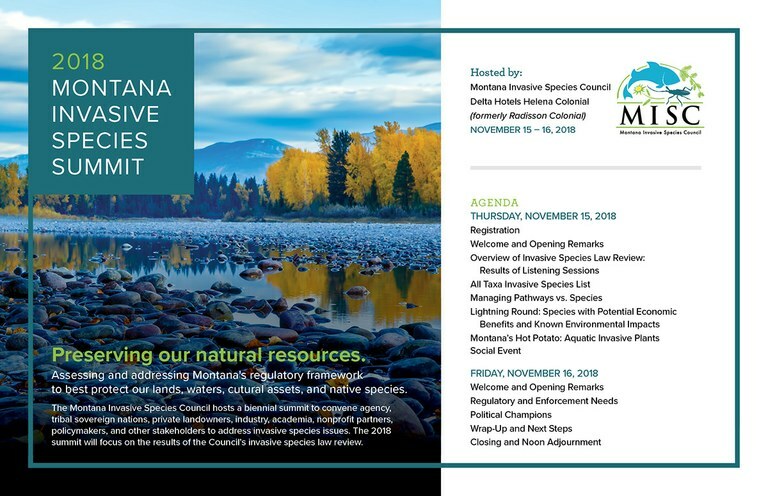 The Summit will be a forum for invasive species managers, county leaders, local and tribal governments, private landowners, lake association members, conservation districts, angling groups and others who work at the local level to review law review findings, suggest action, provide the latest science, and develop recommendations to address invasive species regulatory issues. This two day-event will also feature national and state leaders and technical experts who will provide insight and best practices on invasive species laws and regulations. Please join us for this important and timely collaboration to learn and plan together for effective, local invasive species prevention in Montana. Click here for draft agenda. Registration fee: $50 to cover meals (breakfast both days and lunch day 1). Registration deadline is November 8. Click here to register. Lodging: a block of rooms have been reserved at the Delta Hotels Helena Colonial. Please call the hotel directly at 406-443-2100 to reserve a room. Mention you are with the "Invasive Species Summit" to receive the event rate of $101 + tax. You can also make a reservation online using this link. CEUs: 3 CEUs in: dealer, agricultural plant pest control, forest pest control, ornamental and turf pest control, aquatic pet control, right-of-way pest control, demonstration & research pest control, regulatory weed, and private agricultural pest control can be earned November 15 at the Summit. Credits are not available for November 16. Scholarships: A limited amount of scholarships are available. Please contact Stephanie Hester for more information.